Abstract. The Chemistry-Aerosol Mediterranean Experiment (ChArMEx; http://charmex.lsce.ipsl.fr) is a collaborative research program federating international activities to investigate Mediterranean regional chemistry-climate interactions. A special observing period (SOP-1a) including intensive airborne measurements was performed in the framework of the Aerosol Direct Radiative Impact on the regional climate in the MEDiterranean region (ADRIMED) project during the Mediterranean dry season over the western and central Mediterranean basins, with a focus on aerosol-radiation measurements and their modeling. The SOP-1a took place from 11 June to 5 July 2013. 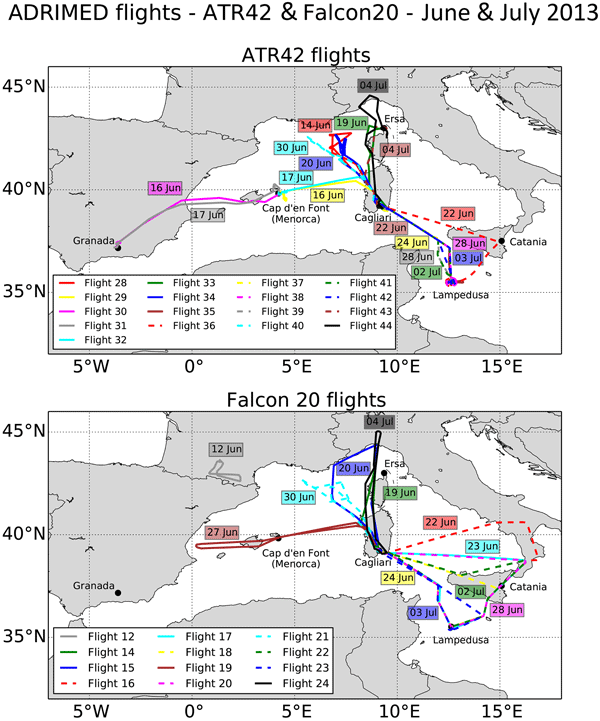 Airborne measurements were made by both the ATR-42 and F-20 French research aircraft operated from Sardinia (Italy) and instrumented for in situ and remote-sensing measurements, respectively, and by sounding and drifting balloons, launched in Minorca. The experimental setup also involved several ground-based measurement sites on islands including two ground-based reference stations in Corsica and Lampedusa and secondary monitoring sites in Minorca and Sicily. Additional measurements including lidar profiling were also performed on alert during aircraft operations at EARLINET/ACTRIS stations at Granada and Barcelona in Spain, and in southern Italy. Remote-sensing aerosol products from satellites (MSG/SEVIRI, MODIS) and from the AERONET/PHOTONS network were also used. Dedicated meso-scale and regional modeling experiments were performed in relation to this observational effort. We provide here an overview of the different surface and aircraft observations deployed during the ChArMEx/ADRIMED period and of associated modeling studies together with an analysis of the synoptic conditions that determined the aerosol emission and transport. Meteorological conditions observed during this campaign (moderate temperatures and southern flows) were not favorable to producing high levels of atmospheric pollutants or intense biomass burning events in the region. 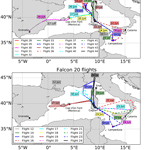 However, numerous mineral dust plumes were observed during the campaign, with the main sources located in Morocco, Algeria and Tunisia, leading to aerosol optical depth (AOD) values ranging between 0.2 and 0.6 (at 440 nm) over the western and central Mediterranean basins. One important point of this experiment concerns the direct observations of aerosol extinction onboard the ATR-42, using the CAPS system, showing local maxima reaching up to 150 M m−1 within the dust plume. Non-negligible aerosol extinction (about 50 M m−1) has also been observed within the marine boundary layer (MBL). By combining the ATR-42 extinction coefficient observations with absorption and scattering measurements, we performed a complete optical closure revealing excellent agreement with estimated optical properties. This additional information on extinction properties has allowed calculation of the dust single scattering albedo (SSA) with a high level of confidence over the western Mediterranean. Our results show a moderate variability from 0.90 to 1.00 (at 530 nm) for all flights studied compared to that reported in the literature on this optical parameter. Our results underline also a relatively low difference in SSA with values derived near dust sources. In parallel, active remote-sensing observations from the surface and onboard the F-20 aircraft suggest a complex vertical structure of particles and distinct aerosol layers with sea spray and pollution located within the MBL, and mineral dust and/or aged North American smoke particles located above (up to 6–7 km in altitude). Aircraft and balloon-borne observations allow one to investigate the vertical structure of the aerosol size distribution showing particles characterized by a large size (> 10 µm in diameter) within dust plumes. In most of cases, a coarse mode characterized by an effective diameter ranging between 5 and 10 µm, has been detected above the MBL. In terms of shortwave (SW) direct forcing, in situ surface and aircraft observations have been merged and used as inputs in 1-D radiative transfer codes for calculating the aerosol direct radiative forcing (DRF). Results show significant surface SW instantaneous forcing (up to −90 W m−2 at noon). Aircraft observations provide also original estimates of the vertical structure of SW and LW radiative heating revealing significant instantaneous values of about 5° K per day in the solar spectrum (for a solar angle of 30°) within the dust layer. Associated 3-D modeling studies from regional climate (RCM) and chemistry transport (CTM) models indicate a relatively good agreement for simulated AOD compared with observations from the AERONET/PHOTONS network and satellite data, especially for long-range dust transport. Calculations of the 3-D SW (clear-sky) surface DRF indicate an average of about −10 to −20 W m−2 (for the whole period) over the Mediterranean Sea together with maxima (−50 W m−2) over northern Africa. The top of the atmosphere (TOA) DRF is shown to be highly variable within the domain, due to moderate absorbing properties of dust and changes in the surface albedo. Indeed, 3-D simulations indicate negative forcing over the Mediterranean Sea and Europe and positive forcing over northern Africa. Finally, a multi-year simulation, performed for the 2003 to 2009 period and including an ocean–atmosphere (O–A) coupling, underlines the impact of the aerosol direct radiative forcing on the sea surface temperature, O–A fluxes and the hydrological cycle over the Mediterranean. How to cite: Mallet, M., Dulac, F., Formenti, P., Nabat, P., Sciare, J., Roberts, G., Pelon, J., Ancellet, G., Tanré, D., Parol, F., Denjean, C., Brogniez, G., di Sarra, A., Alados-Arboledas, L., Arndt, J., Auriol, F., Blarel, L., Bourrianne, T., Chazette, P., Chevaillier, S., Claeys, M., D'Anna, B., Derimian, Y., Desboeufs, K., Di Iorio, T., Doussin, J.-F., Durand, P., Féron, A., Freney, E., Gaimoz, C., Goloub, P., Gómez-Amo, J. L., Granados-Muñoz, M. J., Grand, N., Hamonou, E., Jankowiak, I., Jeannot, M., Léon, J.-F., Maillé, M., Mailler, S., Meloni, D., Menut, L., Momboisse, G., Nicolas, J., Podvin, T., Pont, V., Rea, G., Renard, J.-B., Roblou, L., Schepanski, K., Schwarzenboeck, A., Sellegri, K., Sicard, M., Solmon, F., Somot, S., Torres, B., Totems, J., Triquet, S., Verdier, N., Verwaerde, C., Waquet, F., Wenger, J., and Zapf, P.: Overview of the Chemistry-Aerosol Mediterranean Experiment/Aerosol Direct Radiative Forcing on the Mediterranean Climate (ChArMEx/ADRIMED) summer 2013 campaign, Atmos. Chem. Phys., 16, 455-504, https://doi.org/10.5194/acp-16-455-2016, 2016.